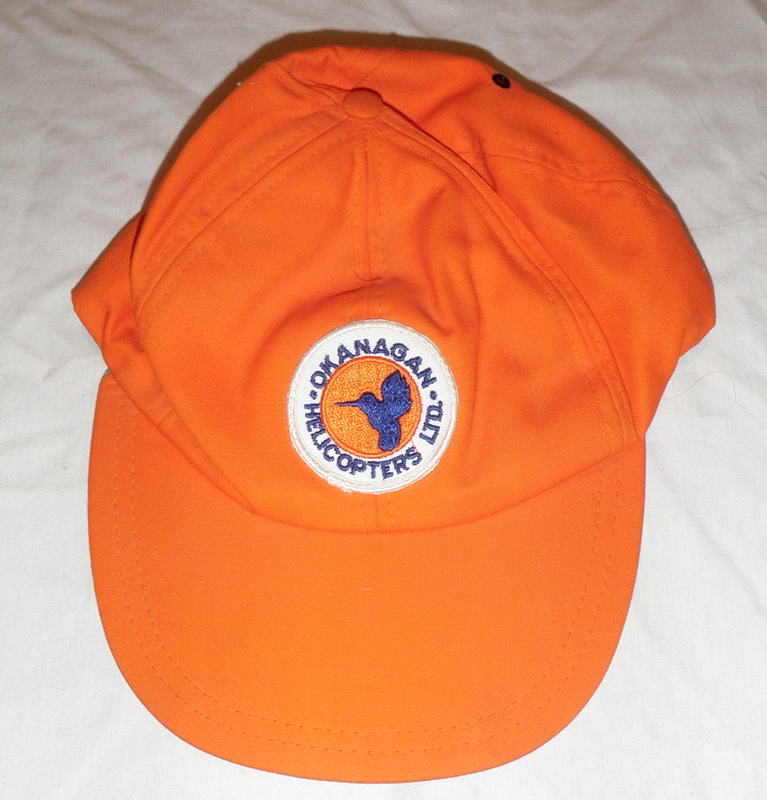 While looking through our artifact collection this summer we stumbled upon a familiar item: an Okanagan Helicopters baseball cap in the trademark orange and blue. We recognized the cap’s distinctive hummingbird logo because a helicopter enthusiast we know [Editor’s note: Jaimie’s father] has the exact same hat, but we were unsure why this hat would be part of our artifact collection. The hat in all its orange glory. Heli-skiing in the Whistler area has long been a popular activity, since the choppers provide access to the glaciers and backcountry areas for skiers looking for prime powder skiing. Pamphlets from the museum’s research files reveal that a bevy of helicopter companies were involved in providing heli-skiing tours, including Canadian Helicopters Ltd (one of the companies which Okanagan Helicopters became when it was restructured in later years, who also had a hummingbird logo). Franz Wilhelmsen and Willy Shaeffler with an OK Heli, 1960s. Issues of the Garibaldi Whistler News going back as far as 1970 also prove that Okanagan Helicopters was the one of, if not the, first company offering heli-skiing services in the Whistler area. The company was allied with skiing superstar Jim McConkey, who was the Director of the Garibaldi Ski School at the time and acted as the guide on heli-skiing trips. 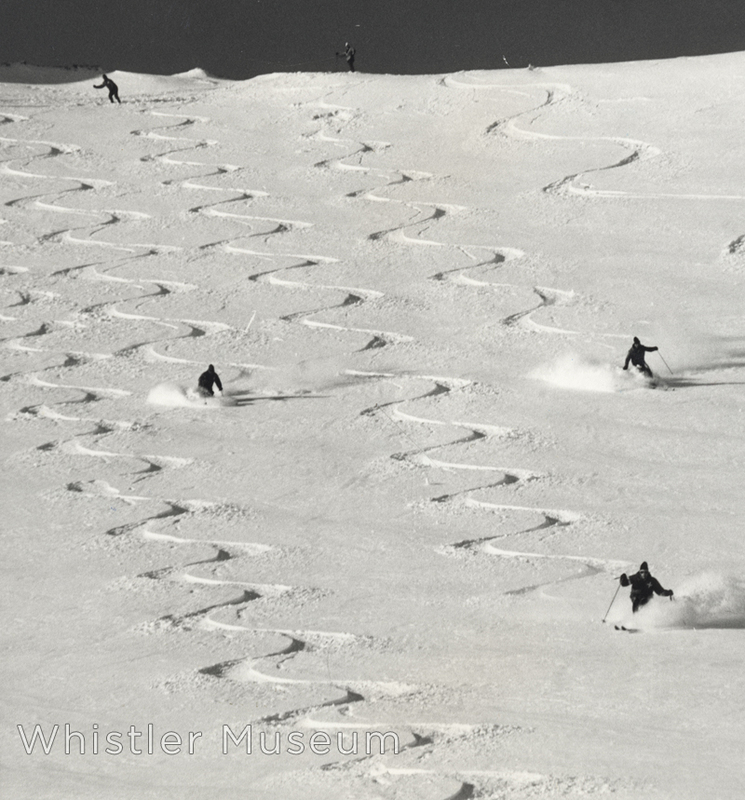 Early heli-skiers, near Whistler. Yes, winter is coming. But the connection between Okanagan Helicopters and the resort goes back even further. 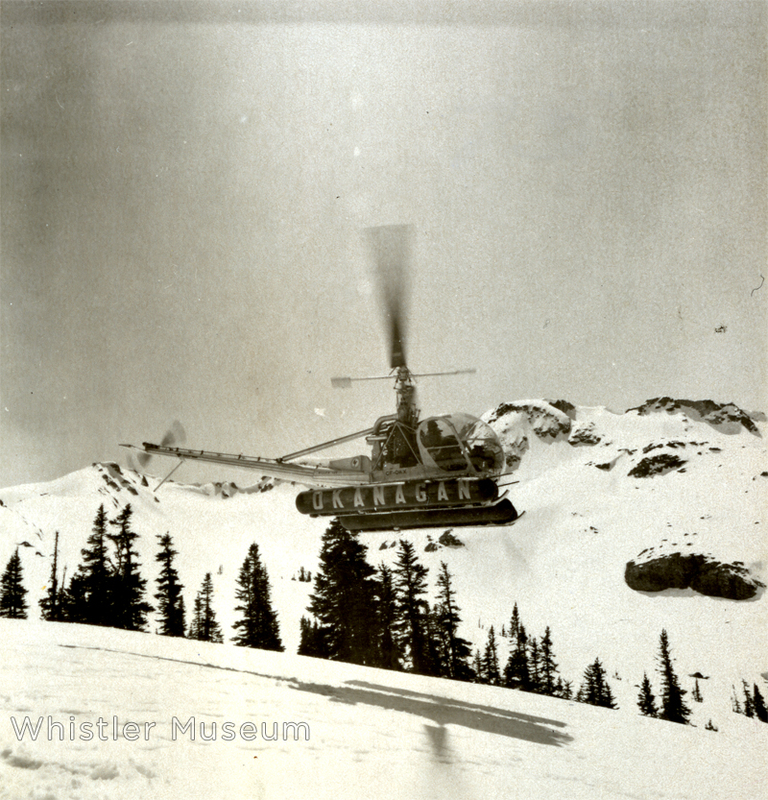 Photos in the Museum’s collection show many Okanagan Helicopters machines, and the earliest photos from the Whistler Mountain Ski Corporation collection reveal that Okanagan Helicopters was the company that took Franz Wilhelmsen and company on tours of the area during the early 1960s to scope out the viability of developing a ski resort. Touring around the Whistler Mountain alpine, early 1960s. Once the decision was made to make the resort a reality, Okanagan Helicopters was called upon again. Construction of the lift towers was done before ground transportation up the mountain was feasible, and helicopters were thus chosen the construction vehicle of choice. When the Garibaldi Olympic Development Association (GODA for short) was formed to promote Whistler Mountain as a potential host for the 1966 Olympics Glen McPherson, the president of Okanagan Helicopters, was on the committee due to the company’s important role in the construction of the resort. The hat itself is most likely from the late 1970s or early 1980s – before Okanagan Helicopters became Canadian Helicopters Ltd and CHC in 1987- but the legacy of how it came to be in the collection goes back almost 20 years to the very beginning of the Whistler-Blackcomb resort. This entry was posted in From the Archives, Skiing, Whistler Blackcomb and tagged Heli-skiing, helicopters, Okanagan Helicopters. Bookmark the permalink. 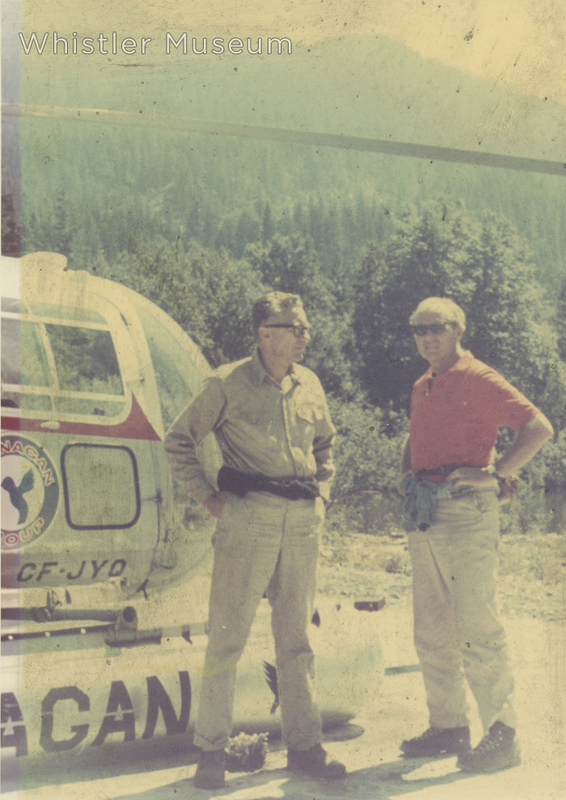 Unidentified man with my Dad in the Okanagan Helicopter picture is Willy Shaeffler, the principle architect of the original design of the mountain runs at Whistler. Could that mystery man be Willy Sheffler? ?